Today I wanted to try something a little different. This blog was the place I started in 2009, and it has done many transformations. This may or may not be another one…we’ll see how it goes! I want to start a series where I answer reader’s questions. Do you like that idea? It could be a fun way to interact as well as solve some dilemmas that many other people may be having. It will depend on you guys as well! The more questions I have, the more regularly we can do this. I hope it can become a regular installment once a week. Deanna, this is a great question. First of all, I want to congratulate you on winning the TV conversation with your husband. This is a difference of opinion that has taken place in almost every home across North America. I personally prefer the television to be out of living and family rooms that are more formal in nature. Many wives will be wondering how you did it, so you may want to share in the comments…lol! 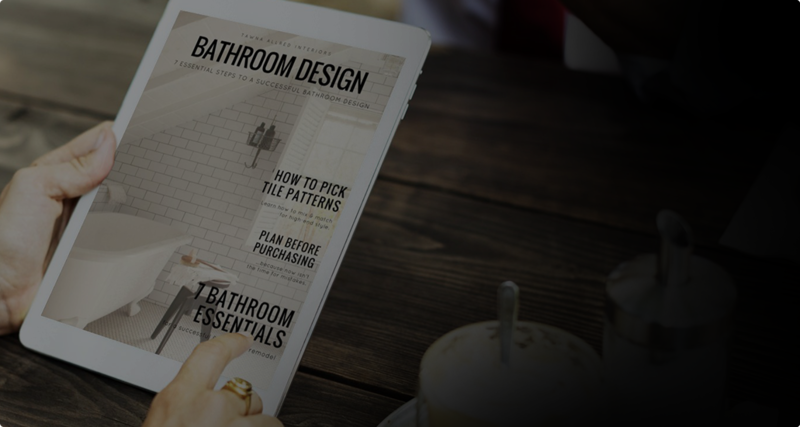 The stone issue is one we can’t get into today (architectural and structural details need to be discussed with a designer and/or contractor that can view your home in person), but we can tackle the styling issue. Let’s dive into option No. 1! I like the idea of a painting more than the mirror because you have so much gray. The neutral foundation is a wonderful asset. Now it’s time to inject some life into your room! Pick a painting that speaks to your soul (don’t just pick up a colorful print at your nearest craft store) and that gives you an even reveal inside the television nook. It needs to be larger than the mirror that is currently sitting there, and I want you to hang it. We dealt with this very issue on one of my first design projects, and we used a painting to hide the electrical. I reached way back into my archives to find a photo. Great original art can be found on Saatchi, Chairish, and Etsy. Take it from an artist, someone will greatly appreciate your support if you purchase directly from them. If an original art piece is out of the budget, there are lots of great tutorials on how to D.I.Y your own abstract art. It’s a fun, affordable approach. No. 2 and No. 3 are both two versions of the same thing. 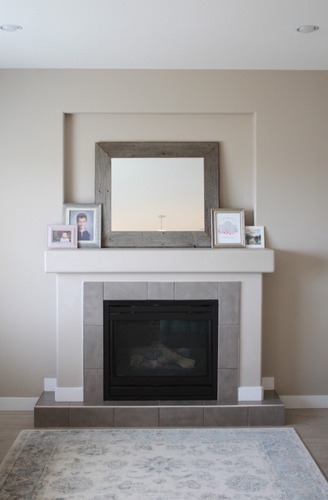 Take a look at what Brooke Giannetti did with panels and wallpaper. 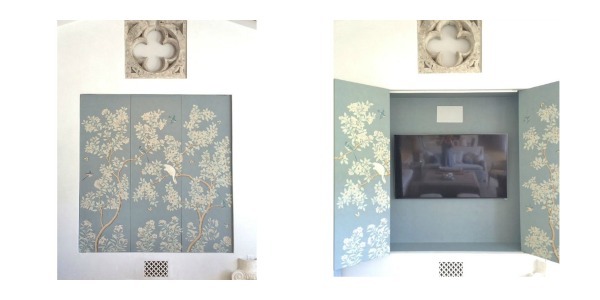 Isn’t it the most gorgeous solutions you’ve ever seen to hiding a television? I also love that she painted the interior a spot-on paint color so it looked beautiful when it was open. Reach out to a designer for great wallpaper options, or find some online. 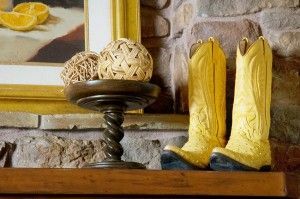 Decorator’s Best has some of my favorite brands. You could do the same thing with wood shutters, if that is more up your alley. Finishing touches would be up to you, but I would personally clear everything off of the mantle and let the art or panels shine. I hope that helps, Deanna! Now I need your support. Chime in in the comments with your styling ideas, or send in your question for the next Q & A via my contact page. I would love to hear from you. Love the styling tips!! Thanks, Tawna!